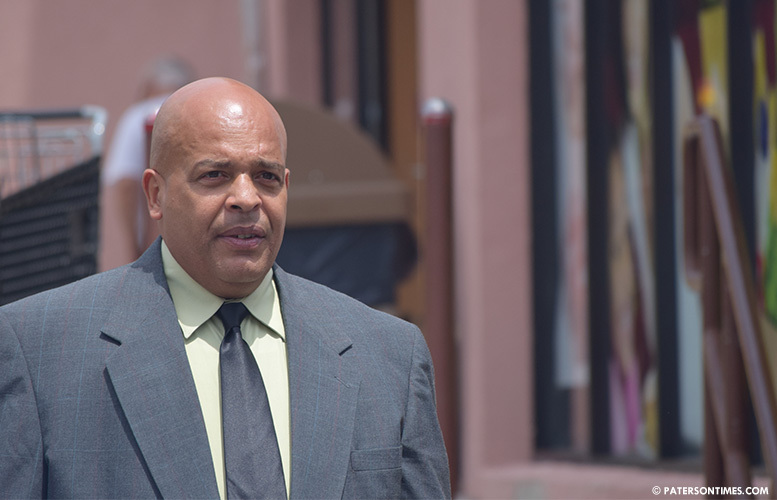 Juan ‘Mitch’ Santiago, who served three terms on the school board, has grown tired of the corruption in the Silk City, forcing him to return to politics. He is running a campaign as a “clean cut” politician promising to ensure basic services are provided to residents. “People are tired,” said Santiago, who works as a sanitation supervisor for public works. He said once he was offered $10,000 by someone but refused to take it. “I’m clean cut. I’m not here for the money,” he said. Santiago, 53, has been working for public works for 33 years. He makes $43,000, according to municipal records. “It’s not for the money. I’m able to put food on the table for my children,” he said. He provided his views on a series of issues that, if elected, he will have to vote on in the city council. Santiago said he favors spending funds on the Great Falls and the Hinchliffe Stadium. Santiago is skeptical of the 79-percent reduction in non-fatal shootings at designated crime hotspots, where businesses are forced to close at midnight. Santiago said he wants police to do another study. “The data could be right, it could be wrong,” he said. He will look at any new hotspot designation in a case-by-case basis. “Everybody’s talking about tax abatements,” said Santiago, referring to long-term payment in lieu of taxes (PILOT) agreements. “I don’t want that. I’m just against it.” He said there has to be other tools to attract development rather than giving out 30-year tax deals. Santiago, who is the brother of public works director Manny Ojeda, knows firsthand the challenges public works employees face with old equipment. “We have one patch truck for the entire city of Paterson. Are you kidding me?” he said. This has made filling potholes difficult. He wants to invest in equipment to ensure basic services are provided to residents. Santiago said the city needs to cut unnecessary positions to shift the money to buying needed equipment. “We have people in some positions that shouldn’t be there,” said Santiago. He has a strong position on hiring local residents for jobs. He vowed to reject the next mayor’s directors if the appointees do not live in the Silk City. “I’m voting no. I want nothing but city residents. We have well qualified people here,” said Santiago. He said many of these cabinet level positions can be filled with city residents for under $100,000. Santiago was born in Puerto Rico. He was raised in Bronx, New York. He arrived in Paterson at age 15. Three months before graduation, he dropped out of high school. He regretted it and worked hard to obtain his General Equivalency Diploma (GED). He became a constable and served in the Army National Guard, he said. After he was elected to the school board he served twice as vice president and once as president, he said. “I ran when there was 23 people,” recalled Santiago. He lost the first time he ran. “I came in fourth,” he said. Next year, he ran and won. Santiago is running with mayoral candidate Pedro Rodriguez and former councilman Mohammed Akhtaruzzaman.